Petros Agiasiotis, who is currently playing for the U-16 team of DORTMUND BVB, as well as the U-16 Hellenic National Team, visited during his short stay in Greece, the academy which he considers his home. According to Petros, every time he is in Volos, visiting the academies of ERMIS FC – Volos brings him great joy. Petros, who originated from ERMIS FC – Volos Football Academies, loves to hang out with the youngsters of the academy; it is his way of illustrating to them that anything is possible and that, even though he managed “the international jump”, he still remains “ordinary”, calm and collective. As a result Petros is loved, and admired, by all youngsters of ERMIS FC – Volos Football Academies. 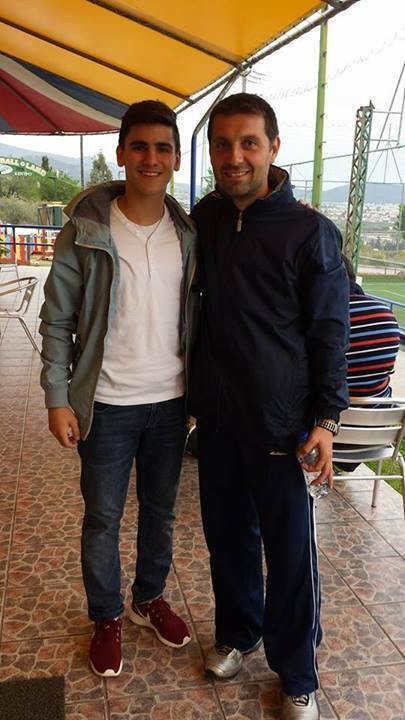 Petros (left) with the Director of ERMIS FC – Volos Football Academies, Mr. Chronis Sapounas (right).